InSight Desktop Search :: Search for files| Search for music| Search for Emails| Search Wikipedia. 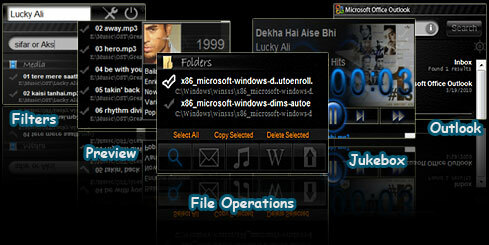 Easily Search For Files/Folders across HDD. Support for shared Network Places. Dedicated Music Search and Playback. Search Outlook Emails and Contacts. Search for articles on Wikipedia. Small Index size and Live updations. Quick Disk Indexing Speed : 1-2 min. It's just how fast can you type?? Is your desktop search software taking life out of your PC? Does a simple task of finding files, bring your PC to it's Knees? 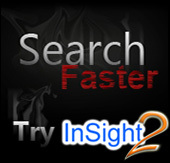 InSight attempts to make the whole idea about searching content on PC extremely easy and quick. Search your files as quick as 100ms without sacrificing on your systems precious resources. InSight supports searching files based on metadata contained in files. InSight supports following formats : JPEG files(Exif data) , Mp3 and Wma files, Exe files, and Microsoft Office files. 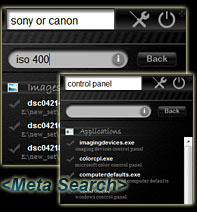 Its extremely easy to search for files using the meta-information, instead of just the filenames. Support for other common formats like PDF files, TIFF, etc. will also be added soon. Small or Large, every bit helps. InSight needs your help in order to stay online. If you find the software useful, do extend your support to the software! *App. Hot Key: Ctrl + Alt + I. "InSight Desktop Search- Fast and Robust"
"Find all that is on your computer in seconds with this great program for search!" 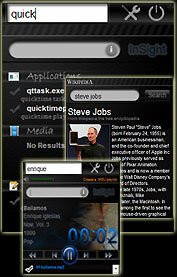 InSight Desktop Search- copyright © 2009 Pranav Kapoor. All rights reserved. "Wikipedia® is a registered trademark of the Wikimedia Foundation, Inc.
Outlook® is a registered trademark of Microsoft® corporation. Microsoft ® is a registered trademark of Microsoft ® corporation.